Watch Warehouse sells 100% authentic luxury watches, fine pens, jewelry, etc. With 20 years of experience in the luxury products industry, we are aware of just how important product authenticity and certification are to our customers. Below, you can read more about how Watch Warehouse works, along with the measures we have taken to maximize your trust in us. Watch Warehouse’s mission is to make authentic luxury watches and other goods more affordable. We buy all of our products at wholesale prices from authorized dealers and respected industry wholesalers and distributors. We are not constrained by pricing restrictions, and you get to benefit from our extra low prices! Read more about who we are and what we do here on our About Us page! All authentic luxury watches and other products are brand new, with their original box and manual intact and included! For watches and pens, original serial numbers and case numbers are also included with your purchase. As an added guarantee, we will include our original signed Certificate of Authenticity with every product. When you make your purchase, you also get a 30-day return policy as a safety net. If you feel any dissatisfaction with your product, you’ll be able to send it back! 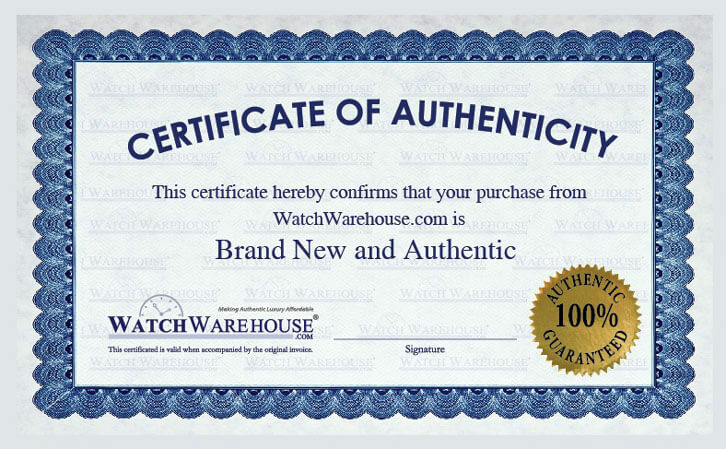 Though Watch Warehouse products are all authentic and certified, we are not an officially authorized dealer for all brands whose products we carry. We have replaced each product’s original manufacturer’s warranty with a Watch Warehouse 2-3 year warranty. Some product packaging may have been modified to make this replacement. We apologize for any inconvenience that may cause! If you frequently buy luxury products such as authentic luxury watches, then it may help to educate yourself on how to discern an authentic product from a fake one. Authentic luxury watches are generally heavy, marked with serial numbers and / or case number / manufactured number, and have a very precise second hand. You will find that this is true of the high-end luxury watches we carry here. Customer reviews aggregated through Google reveal an average of 94% satisfaction among nearly 200 customers. Find out why so many people love our site by reading their reviews, or simply buying a watch yourself! We pride ourselves on our customer service, which you can take advantage of if you have any question about our authentic luxury watches. If you have any concerns about our certification or the authenticity of our products, just ask! People love to receive luxury watches, pens, and jewelry as gifts. Give family, friends, or yourself a gift to remember by picking the perfect luxury item from our site. You won’t break the bank like you would if you bought from a primary retailer. Browse with confidence today!